You are here: Home / Ethnic Groups / The People of Maluku / Who are the East Makian? Who are the East Makian? The East Makian, also called the Inner Makian, live on the east coast of the island of Makian. The rest of the island is inhabited by the West Makian. Makian is part of the province of North Maluku. The Maluku Islands, historically called the “Spice Islands,” consist of over one thousand islands scattered throughout eastern Indonesia. They include most of the islands between Sulawesi and Papua, and between Timor and the Philippines. The East Makian people can also be found in small communities on the islands of Bacan, Obi, and Mori Kayoa. The East Makian language, Tabayama, is part of the Austronesian language cluster. 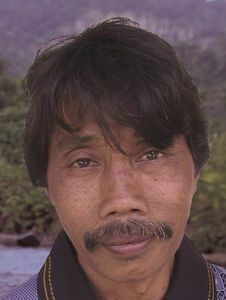 Tabayana is part of a larger linguistic group called the South Halmahera which also includes the Gane, Patani, and Sawai. Most East Makian people are farmers. Since their land is not appropriate for growing rice, their primary crops are corn and bananas. Infertile land is generally left to lie fallow for as long as 7-10 years. Such land becomes available for use by anyone who wishes, until the owner returns to work it again. The East Makian also cultivate coconuts, which are processed to become copra. The East Makian who live on Halmahera and the nearby islands mostly work as fishermen. The East Makian social system is a clan system, in which each family line in known as a soa. Individuals must marry someone from outside their soa. Traditionally, a new couple lives in the neighborhood of the husband’s family. As Muslims, the East Makian practice rites such as circumcision, prayer services at the mosque, and fast during the month of Ramadan. Traditional beliefs about the supernatural realm, however, have a powerful influence on their daily lives. The shaman is a powerful figure in their communities. Islam was brought to the East Makian through a man named Mohamad Arzad, a Minangkabau Muslim from West Sumatra. He married the daughter of the Makian king. The East Makian need better means of sea transportation in order to expedite their trade and relationships with the communities of the neighboring islands. Formal and informal education is also needed to increase their income and improve their quality of life.